When long healthy hair is so highly regarded as reflecting youth and beauty, it's no wonder we all want to get in on it. Maybe you're one of the lucky ones who are naturally blessed with gorgeous locks, but for the rest of us it can take time and effort. I personally have hair that not only grows at a snails pace, but what I do have is so wispy and fine it doesn't exactly stand up well to being abused with hair dyes, bleach and heat styling tools (which you'll know I clearly can't leave alone if you've read any of my past posts!) I recently spoke about some of my favourite repairing hair products, but you don't always have to resort to expensive treatments. There are so many home remedies with excellent repairing properties that you probably have in your kitchen or fruit bowl right now! Here are some of my favourites, and how they benefit the hair. Rich in fats and protein, eggs are great for applying to the hair once a month to strengthen and nourish the strands. While it's the yolk that contains most of the beneficial properties, the whites have bacteria eating enzymes that are great for gently removing oils from the hair and scalp. A protein hair treatment like this should always be followed up with a deep conditioner to stop hair from going brittle- and only use once a month as loading it up with too much protein is actually damaging. Whisk them up in a bowl and carefully apply the mixture to towel dried hair- don't go randomly cracking eggs onto your head, as hilarious as that would probably be I'm pretty sure most of the mixture would end up everywhere other than your hair. Honey is one of natures miracle ingredients. Anti bacterial, anti fungal, has healing properties and even acts as a 'humectant' which attracts moisture- perfect when it comes to using on the hair. It nourishes and enriches the hair, and mixed with some of the other ingredients you don't need much of it to reap great benefits. Some natural oils that are particularly beneficial for the hair are coconut oil, olive oil and sweet almond oil as they're able to penetrate through the shaft of the hair in order to provide moisture (unlike other oils that will only sit on top of the hair strands). They condition and moisturise, promote scalp health and fight off fungi and bacteria among other things, it's no wonder women around the world have been using these on their hair for centuries. This might seem like a bit of an odd one, but vinegar can be really beneficial for the hair. It's a great clarifier which can help remove product build up, dirt, oils and pollution. I honestly cant stand the smell of vinegar, but as I do a lot of intense deep conditioning treatments I find it's handy to have in the kitchen for when my hair starts to feel a bit weighed down and so try to grin and bear it. 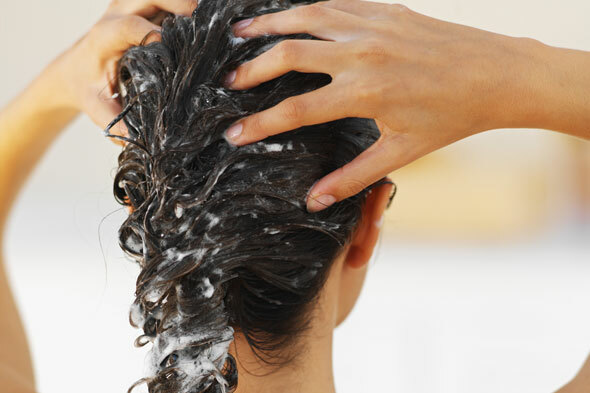 Simply rinse all the way through your hair once a month, and follow up with your regular shampoo and conditioner. A great, gentle alternative to expensive clarifying shampoos! Once you've decided on the ingredients you want to use, you're ready to make your DIY hair mask! Carefully mash or blend any solid ingredients to a smooth paste, and mix in your oils or liquids to form your mask. Run it through damp towel dried hair and generously wrap some cling film around it, which will stop you from making a mess (plus the heat from your head will speed up the conditioning process). Then all that's left to do is wait for it to work it's magic for twenty minutes. Read a magazine, play a game of online bingo or just pop on a face mask and relax! Rinse it out and enjoy the benefits of smoother and more manageable hair. What are your favourite DIY hair mask ingredients? Have been using oils for a few months but they are leaving it too greasy. Think I may need to try avocado! Definitely going to try some of these out! Thanks! However I'm just not brave enough to put food on my hair, which is ironic because when I was a baby that's how I let my mum know I'd finished my food, put the bowl on my head. Clearly baby me was ahead of the times haha.